Jonathan Ashbrook, left, on his property with Sue and Tom Smith near the site of the Sunrise coal mine outside Homer, Ill. The three are members of a grassroots organization, Stand Up To Coal, opposing the mine. Ashbrook's family has owned land near the seasonal creek known as The Olive Branch for the past 140 years. The original mine permit stated it would use local field drainage tiles for mine discharge, which empties in the Olive Branch about a mile from the mine site. Keith Rohl remembers the day he was asked to lease the coal rights to his farmland in Homer, Ill. It was 2009, a wet year for the crops, when he was lined up at the grain elevator with his neighbors hearing about the proposed Bulldog Mine for the first time. “The neighbors were all talking about, ‘You sell your coal rights, and you get to farm your land on top. You’re going to have all kinds of money and everything.’ And I thought ‘Boy, that sounds great to me, and I was ready to sign up,’ ” he said. But the more Rohl talked with the company who planned to establish the mine, Sunrise Coal LLC, the less he understood about what the mine would mean long term for his community. Since 2009, Sunrise Coal has purchased 400 acres for service facilities and leased 19,500 acres for mining on land just south of Homer, only a few miles down the road from Rohl’s land, according to Sunrise Coal's own website. Rohl fears the mine could potentially hurt the productivity of his crops because the mining could cause his land to sink, damage his field drainage tiles and create air pollution. Other opponents are concerned about possible damage to waterways and roadways, while supporters say the mine will provide jobs and boost the economy. Suzanne Jaworowski, Sunrise Coal spokeswoman, recently wrote in an email that the company's modifications to their original permit will address those concerns. The company is still waiting on two permits from the state before it can open Bulldog Mine. Car stickers at the Sunrise coal mine site near Homer, Ill.
“Before we can issue a mining permit, all of the issues we have authority over, we will require them to be addressed and meet the requirements of our regulations,” said Dean Spindler, geologist at the department’s office of mines and minerals. Sunrise Coal, based in Terre Haute Indiana and a wholly-owned subsidiary of Hallodor Energy Company, owns nine mine facilities along the Illinois Basin, a bituminous coal-producing region comprising most of Illinois and parts of Indiana and Kentucky. According to the U.S. Mine Safety and Health Administration, the mines are Ace in the Hole Mine, Carlisle Mine, Carlisle Preparation Plant, Oakton I, Oakton II,, Oaktown Fuels Preparation Plant, Russellville Mine, Prosperity Mine and the proposed Bulldog Mine. Prosperity Mine is now a non-producing mine, according to federal records. Sunrise Coal started the formal permit process to construct the Bulldog Mine in 2012, but is still waiting on a water discharge permit from the state Environmental Protection Agency and a mining permit from the Illinois Department of Natural Resources before the mine can open. Kim Biggs, EPA spokeswoman, said in late 2015 that the agency is still responding to notes sent in during the public comment period, which ended Sept. 11, and does not know when a decision will be reached. Meanwhile, the natural resources department responded to Sunrise Coal's permit request in March 2015 with 62 questions and concerns requiring modification to its permit, which are due in March 2016. The roots of the company Sunrise Coal trace back to Vermilion County. Ron Laswell, the developer of the Riola Mine, one of the most recent active mines in the county, founded Sunrise Coal LLC in 2002. President Brent Bilsland also got his start in the mining industry while working with Laswell at the Riola Mine.Sunrise Coal is the second largest coal producer in Indiana. According to the federal Mining Safety and Health Agency, it has produced 1.3 million tons of coal so far this year. About 90 percent of coal produced by Sunrise is sold to utilities in Indiana, according to the company’s website. Indiana produces 4 percent of the nation’s coal, while Illinois produces 5.3 percent, according to the Energy Information Administration. In 2009, Sunrise Coal became a wholly-owned subsidiary of Hallador Energy Company, a Colorado-based investor of coal, oil and gas. Hallador also has a 45 percent equity interest in Savoy Energy, L.P., a gas and oil company based in Michigan. Yorktown Partners, a private equity firm in New York that invests in natural gas, oil and coal, currently holds 27 percent ownership of Hallador. The company also holds ownership over Armstrong Energy, which mines the Illinois Basin in Western Kentucky, and Ramaco LLC, which owns a 1.2 ton reserve named the Brooke Mine in Wyoming. After turning down the Sunrise offer, Rohl and his wife Brenda, joined a group of local farmers and landowners in a grassroots group called Stand Up To Coal to advocate against the proposed Bulldog Mine. Many of the modifications required by government officials mirror the concerns of members of Stand Up To Coal, particularly regarding the applicant’s lack of information regarding the presence of natural springs such as the Olive Branch. The original permit stated the mine would use local field drainage tiles for mine discharge, which empties in the Olive Branch about a mile from the mine site. Opponents are concerned because the stream flows into the Salt Fork River, the main drinking supply for the village of Oakwood. A stream on the property of Jonathan Ashbrook near the site of the Sunrise coal mine site near Homer, Ill. The state EPA also recommended an alternative location for discharge. Stand Up To Coal is also concerned with contaminated air, withdrawal of large amounts of local groundwater and the destruction of roads by trucks hauling the coal out of the mine. Jaworowski says the IDNR and the IEPA will address these concerns. 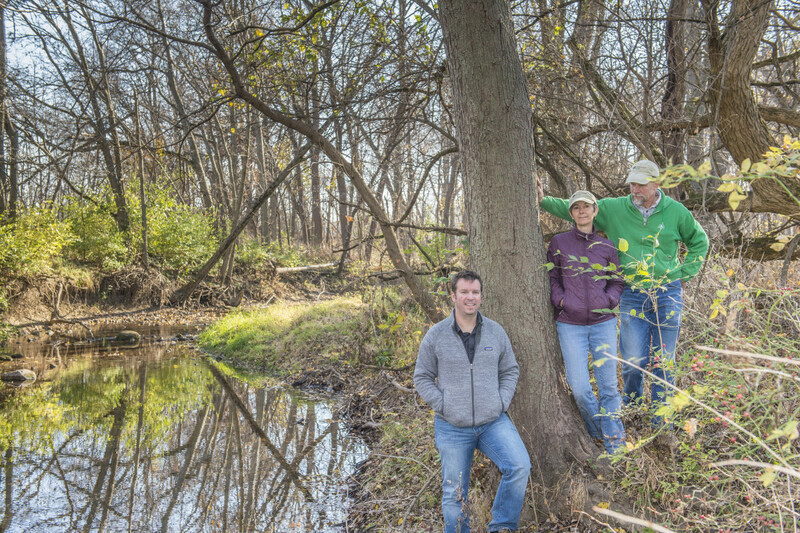 Prairie Rivers Network, an environmental not-for-profit based in Champaign, has been an educational and support network for local farmers advocating against the mine. It cites concerns of pollution of streams from mine runoff water, the use and potential damage of field drain tiles and the creation of slurry impoundments containing toxic chemicals from washed coal. Road signs at the Sunrise coal mine site near Homer, Ill. But some local residents see the mine as a potential boost to Vermilion County’s depressed economy. In July 2015, the Sunset Coal laid off 175 miners at its Carlisle and Oaktown mines, located just two hours southeast of the county in Indiana, but according to the company’s website, Bulldog Mine would bring in 300 local jobs for coal miners. Vermilion County Board member Chuck Nesbitt, district 3, and head of equipment maintenance at Wayne Transports in Danville, has testified in support of the mine at state agency hearings, saying the economy needs the jobs. “To be able to get the 300 jobs plus the spin off jobs that will be coming to support the mine, that’s going to be a big deal,” he said. Calls made to many of these landowners were not returned and several individuals declined to comment out of fear of retaliation from those opposed to the mine. But for Joe Ford, a farmer from Sidell who leased his rights sometime between 2009 and 2010, the reason he signed up is simple. So far, he has received an initial “startup” sum of money from Sunrise Coal. Ford said he doesn’t have any concerns about the mine because he believes coal mining is one of the most regulated industries in the country. Sunrise Coal was cited for hundreds of violations at three of its Indiana mines in 2015, according to data from the federal mine safety agency. Yet, a company spokeswoman said the company is one of the safer ones. “Citations are part of the safety process.” said Suzanne Jaworowski. “If you put it in context of other mines our size, we have one of the best safety records in our region.”The company was cited for a total of at least 600 violations in 2015 at three of its Indiana mines, according to data from the federal mine safety agency. The company paid at least $235,000 fines for those violations. Sunrise was most frequently fined for the accumulation of combustible materials. Sunrise’s violations are some of the most commonly cited for underground mines, according to the federal mine safety agency. Administrators from the federal mine safety and health administration were hesitant to compare different mining companies because there are “too many variables to consider.” Violations are considered on an individual basis for correction. One standard for judging mine safety, hower, is to look at violations per inspection day. Federal data show national averages for violations per inspection day for underground mines is .66, while all Sunrise Coal mines individually received averages of .42 per inspection day or less. But farmers such as Brenda Rohl argue that the mine could take away more jobs that it says it will bring in if farmland is damaged. Keith Rohl isn’t so worried about what the mine will do in the next few years. He figures there will be some issues, but his biggest concern is what the land will look like when the coal runs out and the miners pack up. “I think [the next generation] is going to be the ones to deal with it. [If I signed up,] my son will be like, ‘Why did dad do that?’ ” he said, noting his son will be the fifth generation to farm their land. A big worry for farmers, Rohl said, is subsidence — or the gradual sinking of land that can be caused by underground mining over long periods of time. Even a few inches of ground movement could disrupt the flow of water in field drain tiles, which could hold pockets of water in certain areas and drown the crops, he said. Vermilion County has a long history of coal mining, Spindler said, and he isn’t aware of any subsidence issues in the county from modern mines active after 1980s. Nesbitt says his family has never worried about whether the mines would disrupt their crops. “[My family has] farmed that ground consistently for 150 years with no ill effects of an underground coal mine,” he said, adding that Nesbitt’s family farms have stood over five mines, including the Bunsen Mine, Riola Mine, Vermilion Grove Mine and two Peabody Mines. Another concern is how the land will be reclaimed and returned to its original state after coal is extracted. Spindler says laws for mining reclamation have modernized drastically over the past 100 years. Currently, in the case that mining companies do not reclaim their mines once they close, companies like Sunrise Coal must pay an upfront sum equal to what it would cost to reclaim the mine when it receives the permit. “If they were not to do the work, they would forfeit that money and we would hire a contractor to complete the reclamation,” Spindler said. For Keith and Brenda Rohl there are still so many unanswered questions regarding how the proposed coal mine will affect the community. But they said one thing is certain: It won’t change how they feel about their neighbors who support the mine. “We don’t want to divide the community and it appears that that’s what Sunrise [Coal] would like to see: divide and conquer. And we’re not going to let that happen,” Brenda Rohl said. Click on mine site to get more information about that mine. This story was produced by CU-CitizenAccess.org, a community online news and information project based at the University of Illinois and devoted to investigative and enterprise coverage of social, justice and economic issues in east central Illinois.